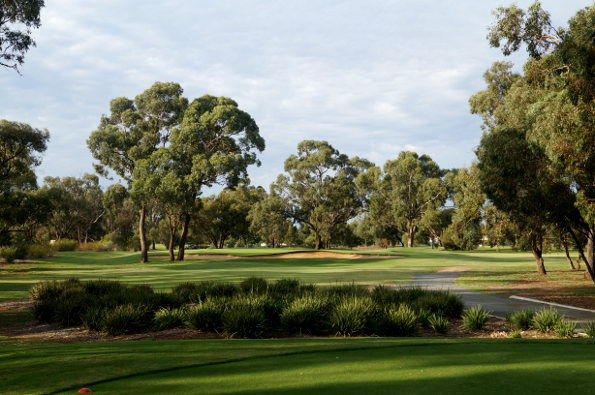 The Rich River Golf Resort at the twin towns of Echuca-Moama, second stop on a memorable golfing experience. IT all seemed so simple in the beginning. A five day self-drive golfing odyssey taking in one of Australia’s premier golf and holiday destinations. To start with, early Monday morning just pop down to the lovely Jamberoo Valley, an hour or so south of Sydney, and pick up fellow (much worse, as it turned out) golf tragic Ray Orr. Then off to the Murray River on the NSW/Victoria border for a carefree week of top golf resorts, food, fun and touring. As it turned out, it became a journey, with diversions, of almost 2,000 kilometres, and alas, would also prove to be the very last golf trip for the faithful old red Toyota Camry station wagon. I would also learn, to my astonishment, that the human species can survive on little more than golf, golf chipping practice, golf talk, occasional sleep – and jam donuts. The first hint of trouble came shortly after we had managed to successfully load what seemed to be Ray’s three weeks’ worth of luggage and assorted golf equipment into the Camry. Going up the very picturesque but narrow and steep Jamberoo Mountain Road, I noticed a very fine spray of water emanating from the right hand side of the bonnet. “Don’t worry,” said Ray, after I had explained to him that after years of trouble-free motoring the Camry had started to hint at a few issues. “You probably just overfilled the water tank in your diligence to have everything working perfectly.” Fine, I thought, only 1,995 kilometres and 4.999 days to go. We then moved on to the real business of the day, which turned out to be arguing about whose digital music collection should be playing on the car stereo. (“You seriously don’t think ABBA is suitable driving music?). Our first major stop was Yarrawonga – after a break for lunch at Yass on the 570 kilometre/six hour trip southwest from Jamberoo. A break where I got the first big inkling the importance coffee, jam donuts and meat pies would play in our journey. The plan for the week, as I mentioned at the outset, was simple. 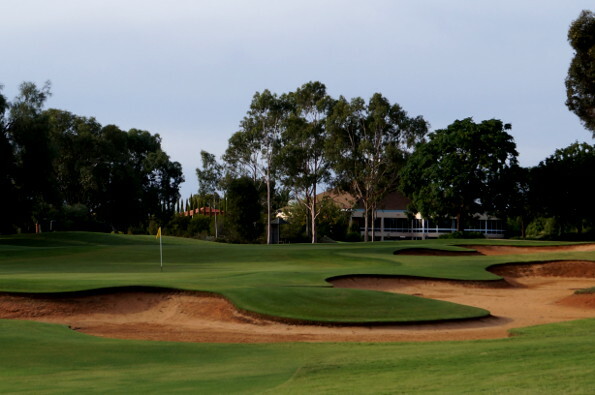 Play and stay at three of the highest rated golf resorts in the Murray River region – Yarrawonga Mulwala Golf Club Resort, Rich River Golf Club Resort and Murray Downs Golf & Country Club near Swan Hill. The plan could not have had a better backdrop. The Murray region stretching from Albury to Mildura has long been a mecca for golfers with some 67 high quality courses; but the area offers so much more, particularly its food and wine trails, historic villages and towns, and all the activities associated with being based around Australia’s (and the world’s third) longest navigable river. The Murray River Tourism Board has recently undergone something of a rebranding focussing on the area not just as a “legendary golf playground” with its classic paddle steamers, houseboats and gourmet experiences in historic towns, but also on all the active pursuits and activities available, such as kayaking, swimming, fishing, boating, wake boarding, mountain-biking and bush walking amid the River Red Gum Forests. The Tourism board kindly offered Australian Senior Golfer the opportunity to visit the area and either stay at Yarrawonga, play three of the nearby premier courses and take in some of the other attractions and water sports, or visit and stay consecutively at the region’s three top resorts. We chose the latter, swayed by the fact that some 12 years ago, around the time I began my “senior” golfing career, I had already spent a delightful week staying in the Yarrawonga area with a group of golfing mates on a boy’s “week of golf” holiday, as so many golfing groups do. We stayed at one of the many golf-focussed motels in the area and over five days played Yarrawonga, Cobram Barooga, Corowa and Tocumwal (and Gundagai on the way down). Yarrawonga, with its lush fairways, spectacular riverside setting and huge River Red Gums had been a real favourite during that first visit as a relatively inexperienced golfer and it was great to return and renew the relationship. Many of the Murray clubs are located right on the NSW side of the state border, originally built or suddenly prospering because of differing poker machine laws – allowed north of the border but not south of it. Like Yarrawonga, they have become so much more than very convivial places developed to encourage southerners to come and have a flutter. Yarrawonga is now Australia’s largest public access golf resort and is consistently rated in the ‘top 100’ public golf courses. The resort boasts two 18 hole courses, the Murray Course and the Lake Course, and the 9 hole Executive Course. Like the other resorts we were to visit, a big attraction was the luxury and convenience of staying in accommodation right on, or overlooking the course. After a leisurely breakfast it is just a stroll to your tee-time. After golf you can just sit and relax and enjoy the clubhouse facilities, dine in one of the restaurants, visit local attractions, or, like Ray, go to the driving range and practice your chipping. The Yarrawonga resort gives you a choice between nine different types of accommodation, from basic cabin-style to luxurious, well-appointed apartments and villas – each with cooking facilities and private bathrooms. There are also tennis facilities, a heated swimming pool and lots of water sports and activities available at nearby Lake Mulwala. While green fees are very reasonable at these courses compared to metropolitan courses, another big advantage is the ability to book great value “stay and play” packages combining on course accommodation, golf rounds, cart hire and meal vouchers. Tuesday morning and after a night enjoying some fine food in the club restaurant and the very well-appointed apartment accommodation, it was off to our first round of golf for the week. In line with his eternal quest to lower his handicap (currently 8), Ray insisted we play in the Tuesday club competition on the quite beautiful Murray Course. 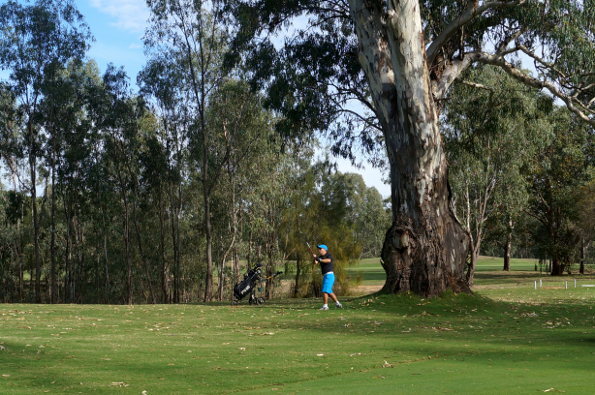 On the Yarrawonga Murray Course you are never too far from one of the towering River Red Gums. We were paired with a retired couple from the far NSW south coast who were returning home after a caravan trip to South Australia. They hadn’t packed full sets of clubs and weren’t registered in the comp but ably demonstrated you can have great fun on this course, whatever level of golfing skill or equipment. 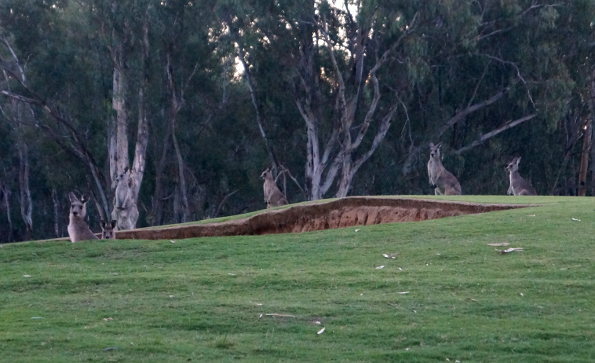 They also demonstrated the eclectic nature of those playing – locals, travelling caravaners, tourists from all over, groups of golfers (men, ladies, couples) enjoying a traditional “week of golf” and, seeing that the area is just over three hours from Melbourne, golfers with “weekenders” in the area. I probably should expound more on the delights of the course, how it meanders through the River Red Gums beside the Murray, but more important perhaps – at least to one person – is that Ray managed to shoot two under his handicap and post the equal best score of the day. He ended up runner-up in the comp on a countback. That’s pretty good for someone who hadn’t had a jam donut all morning and who must have been very, very golf fatigued. After checking in at the resort the previous afternoon he had immediately rushed to the pro shop and bought more range ball tokens than the average golf school would use in a fortnight. Despite his best efforts to personally use them all, he was still giving away tokens as we drove out the carpark on Tuesday afternoon. Our second overnight stop just over a couple of hours and 140 kilometres down the road was the Rich River Golf Club Resort, again just on the NSW side of the border at Moama, across the river from the historic Victorian town of Echuca. Rich River offers a more than comfortable 63-room motel, swimming pool, large Clubhouse with full facilities and an award winning 36 hole golf course. After checking in we first inspected Ray’s accommodation, which management had assured me was the inferior facility. I was quite shocked and appalled at the opulent and well-appointed unit, backing on to a garden which also housed the resort swimming pool and a small gym room. But then I actually walked into the bathroom (as opposed to just quickly sticking my head in) and turned on the light. There was an extended area with an elegant rock feature wall, mood lighting and spa bath. Ray would happily later build this into a narrative along the lines of “the tragic older golfer sitting alone in his honeymoon suite.” I was just delighted to sit sipping the complimentary champagne and muse on what a great thing is golf – and some of the places it takes you. Being a Tuesday night the club’s al a carte options in the James Maiden Bistro were off the menu but many of the smorgasbord offerings were truly exceptional. Such a pity sometimes that the human body won’t let you just keep eating and eating and giving everything a try. The atmosphere was certainly relaxed, with a modern dining area featuring indoor and al fresco dining options and the floor to ceiling windows offering enticing views of the surrounding course. No competition on Wednesday morning so Ray had to settle for 18 social holes on what is an award winning 36 hole complex, featuring rolling fairways, manicured greens and towering eucalyptus. The Par 72 West Course has traditional tree lined fairways with small tricky greens taking the serious golfer on a 6,183m journey. The Par 72 East Course, redesigned by Peter Thomson in 1998, features large greens, wide fairways and Thomson signature bunkers covering 6,131m. Both courses provide outstanding challenges for all players. In the afternoon we ventured across the river, and back in time, to Echuca township. First surveyed in 1854, Echuca quickly became one of Australia’s busiest inland ports, with paddle steamers ferrying supplies throughout Australia’s interior via the river network. These days, the Historic Port of Echuca precinct is still an authentic working steam port, home to Australia’s largest fleet of steam-driven paddle steamers. The paddle steamers’ major cargo now has changed from wool to tourists, and they flock to the area for luncheon cruises or longer holidays up the river. The Port still operates much the same as it did in the 1860’s, with shipwrights and steam engineers providing a vital role in the Port’s operations, just as they would have in the late 1800’s. The township has lots of tourist shops, antique stores and the like. And yes Ray, you can even stop and get a coffee and a jam donut at one of the many cafes and restaurants (as long as you don’t mention anything about golf chipping or bunker play). Wednesday afternoon and out of the 1800s back on to the highway and 165 kilometres west to our next stop, the Murray Downs Golf and Country Club, a few kilometres north of the Victorian town of Swan Hill. Murray Downs boasts not only a Top 100 rated golf course but also a Mediterranean climate with low humidity and more sunlight hours than Queensland’s Gold Coast. The autumn weather has to be experienced with warm days in the mid 20’s and mild nights. Average daily temperature in summer is 28 degrees and 15.7 in winter. 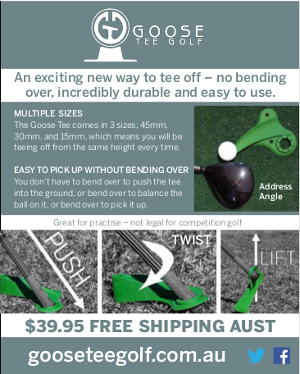 We were really looking forward to the Murray Downs course, which is rated in the 2014 Golf Digest Top 100 Australian Courses, coming in a very creditable 84th. The resort itself was established in 1991 and offers all you could need in terms of excellent accommodation, meal, bar and club facilities, swimming pool and, particularly welcoming for tired golfers, a heated indoor spa pool. 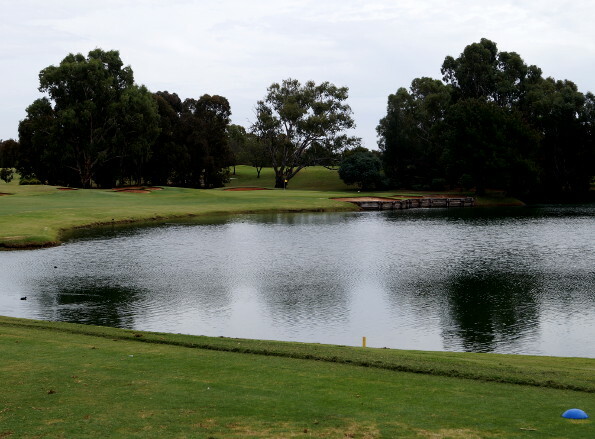 The course is a real gem, the landscaped features and crystal blue lakes and lagoons contrasting starkly with the surrounding Mallee plains scrub. We played in the Thursday stableford competition in a fourball with a local and another visitor. It was quickly apparent how the course had earned its current Top 100 status, with its lush, undulating fairways, extensive red sand bunkering and integral water features. Top courses always not only seem to provide the required golfing challenges, but impress with the way they appear to be built into or even dramatically enhance the natural landscape. None of our foursome came close to winning the comp that day, but we certainly came away richer for the experience. The signature par three 5th hole at Murray Downs entices with a long water carry to a green also well protected by bunkers. A classic risk/reward hole for those up to the challenge. Laying up a little can be good too …. all part of the fun at this top rated course. Friday morning and Day 5 and after a quick trip into Swan Hill to sample the town’s historic and other attractions, including the Pioneer Settlement and paddle steamer wharf, it was time to start heading home. For five days we had been listening to “Stella”, the lady in the GPS, give us directions and she was insistent we start back the way we had come – back safely along the river highways and byways to the Hume Highway and Albury. I wanted something different and, based on a brief consultation with Dr Google the previous evening, thought we couldn’t go wrong just ignoring Stella and travelling north from Swan Hill. You couldn’t help but run into the Cobb Highway at some point, just turn right and you would be through Hay and on toward Jamberoo in no time. In the cold light of day, Dr Google now shows that journey is some 850 kilometres and 9 ½ hours – if you go the short way. We somehow managed not to go the short way, and probably a long way short of the best way, as well. With Stella not providing helpful input and only a rudimentary map otherwise, what can you expect? We did learn though that if you start your golfing experience 560 kilometres west of “home” and just head 160 kilometres or so west every day you might not fully realise just how far “west” you are. And the problem with travelling north from Swan Hill/Murray Downs – without an adequate map – is that there are a number of tributary roads that you might follow, but none of them seems to be the right one. We did stop at a small, run-down garage in a small “outback” town to ask the best way to Sydney. “We’re not sure,” was the surprising and unsettling answer. A response like that isn’t very reassuring when you’re a driver who knows the vehicle you’re travelling in has been inexplicably losing a litre of water a day. What we did manage to find on the trek north – apart from a whole lot of emus – was a 100 kilometre or so stretch of uninterrupted dirt road. A dirt road going through what I would willingly describe as a desert. 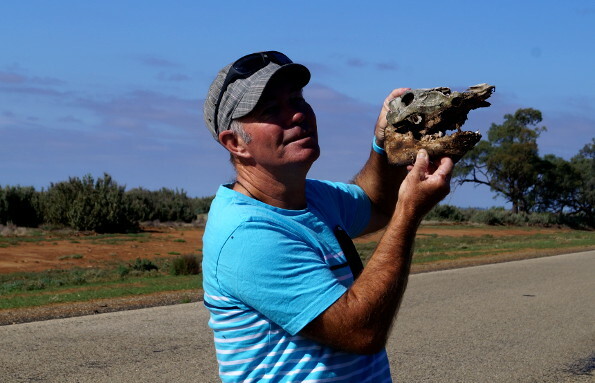 All the emus and other wildlife were fun though, and the Camry didn’t miss a beat, even when we stopped to examine the skeletal remains of some who just didn’t make it through. Somewhere in the desert north of Murray Downs, Ray finally found a non-golfer he could fully relate to. We did eventually get to the Cobb Highway, in all its bitumen based glory, and onto Hay, where the people in the coffee, meat pie and jam donut shop had a fine understanding of the logistics of getting to Sydney. Many hours later it was well and truly dark when I dropped Ray – and his luggage – off at his rural residence in Jamberoo. Driving back down his driveway, again back on a dirt road, I reflected on what had been a great week of golf – and probably also that I had initially been offered a flight to Albury and a hire car. That was about the time when I hit some sort of tank trap – one that had obviously been recently installed in the middle of Ray’s access road. There was a loud “klunk” that seemed to pierce something important in the bottom of the Camry. The Camry limped home, parked in the driveway, and never independently moved again. If a car is going to take you on a 2000 kilometres journey, admittedly through some very civilized and picturesque wine, food bowl and river basin landscapes, but also along a seemingly endless dirt road through a searing desert, the very best time and place for it to seize up and die is overnight in your own driveway. What a car! And what a great trip. Alas, it was the very last golf trip for the old red Camry, pictured here with Karrie Webb playing a vital role at the 2014 Women’s Australian Open at the Victoria Golf Club.